California’s largest oil and natural gas producer on a gross-operated basis. Largest privately-held mineral acreage holder in California with approximately 2.3 million net acres. California Resources Corporation (NYSE: CRC) is an oil and natural gas exploration and production company operating properties exclusively in the state of California. CRC explores for, produces, gathers, processes and markets crude oil, natural gas and natural gas liquids. CRC has a large portfolio of lower-risk conventional opportunities in each of California’s four major oil and gas basins: San Joaquin, Los Angeles, Ventura and Sacramento. 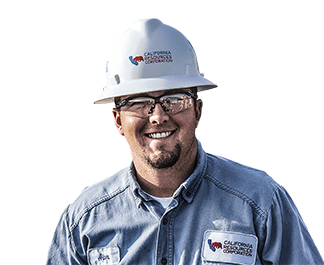 CRC is California’s largest oil and natural gas producer on a gross-operated basis, with approximately 4,000 employees and contractors. The company specializes in applying advanced technology to increase production from our diverse portfolio of reserves. CRC is committed to ensuring safety and protecting the environment everywhere we operate.